A lot of people have asked how I manage to pack so much in: writing, blogging, reading, working full-time, while maintaining relationships with friends and family. I’m by no means an expert– and since I’m single and don’t have kids, my minutes aren’t swallowed by family demands– but here are my thoughts on the matter. 1. Learn to say no. I had to learn how to STOP making plans I didn’t want to keep. I’m so, so blessed to have a huge circle of friends, but when my writing life gets wild, only my inner circle makes it onto my schedule. 2. Be upfront with your friends. When things are crazy with revisions, I tell my friends right away that I’m going to be MIA for a while. Thankfully, I have incredibly gracious friends who respect that! 3. Schedule your blog posts. I hammer out a month’s worth of blog posts in about two or three evenings. Then, like the Showtime Rotisserie Grill, I can “set it and forget it” for another month. Yes, that’s right– I post about 12-15 times a month, but I only work on my blog posts for a couple days. I am always collecting ideas for blog posts and adding them to my blog ideas list on Wunderlist (see #4). Then, about halfway through each month, I will go into my blog, set the schedule and write the title for the entire next month’s blog posts. Over the course of the next day or so, I will systematically go through all those pre-programmed, pre-titled posts and write the actual post. The only other post I have to worry about is my “Dear Diary” post at the end of the month, where I summarize what I’ve been up to. 4. Make lists. I use Wunderlist, and I’ve detailed the amazingness of that here. 5. Listen to audiobooks. I listen during almost any mundane activity I do, most notably driving. Or else I’m calling my mom. Double-duty those commutes! 6. Writing sabbaths. I don’t let myself write on Mondays (usually after a tempestuous weekend full of it). I try to set aside Monday evenings for reading. 7. Overcommunicate. Again, I’m so lucky to have friends to whom I can explain, “I’d love to get coffee and catch up, but I can only stay for two hours.” I often set really clear parameters for what I have time for– not always, but when I’m especially busy. 8. Nap. I wouldn’t be able to power through everything if I didn’t sneak in naps wherever I can find time. 10. Turn off the TV. I almost never watch TV, though I will take in an episode of Law & Order: SVU if my roommate is watching and I’m doing something else simultaneously (researching, for example). I can’t write with the TV on or while watching a movie. 11. Sacrifice. I just can’t do everything I want to do. This, I believe, is just part of the artistic life. 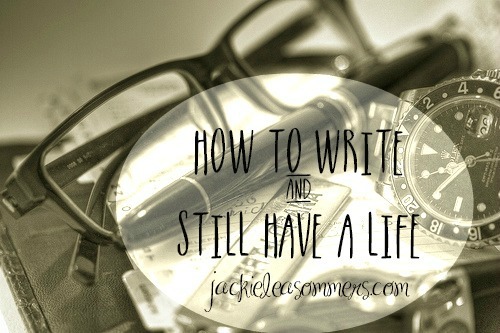 This entry was posted in reading, real life, writing and tagged being a busy writer, having a social life when you're a writer, how to write and have a life, jackie lea sommers time management, not enough time to read and write, time management reading and writing, writing life time management, writing life vs. social life, writing vs. friends by Jackie Lea Sommers. Bookmark the permalink. You’re an inspiration, Jackie! I typically post once a week, and sometimes I find that hard! You’re sweet, Janet. I enjoy it and have so much I want to blather on about that I *want* to post even MORE often … just learning to scale back on things. I think 3-4 times a week is my new sweet spot. You are wise in the manner you divide your time, and learning to say no to excess is a huge skill. Pingback: Web Roundup #1 | Kathy Ellen Davis!